Travelling helps us to slacken and lighten our daily loads with work or stress but sometimes, it can be strenuous to travel especially with a newborn or an infant. 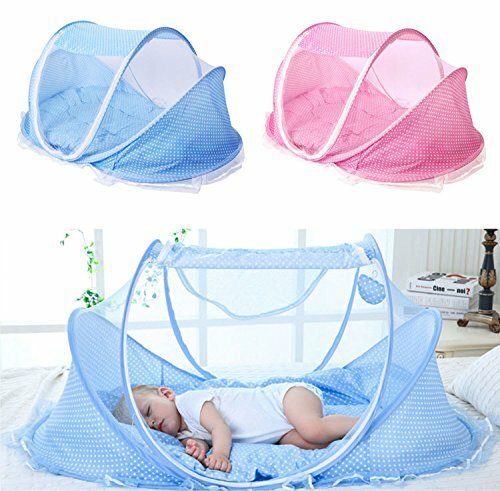 With the Portable Mesh Baby Crib, you can rest well while you’re baby’s enjoying his/her peaceful sleep no matter where you are. This baby item is a must-have for parents who love to travel or those who love going to parks and beaches. It’s a self-expanding screen tent that can be popped open and folded back down in just seconds. It’s delicately designed to provide peaceful and comfort sleep for babieswithout the stress and hassle. It’s so easy to put inside your backpack and bring it along to wherever you and your baby go. Now that’s convenience for you! No matter where you want to go, you don't need to worry about mosquitoes, flies, insects and other annoying bugs at all. The Portable Mesh Baby Crib gives your babies the comfort they need. I bought this for my 13 month old to sleep in on a recent trip. We set it up in the living room ahead of time so she could explore it. This travel bed is wonderful when baby not sleep at home. I went travel and was worried where baby can sleep. This is the best thing i got now, i was traveling with a four months baby, and hard to bring a pack and play with me. And i find this travel bed. This travel bed is very light and soft. Easy to carry. I will definitely recommend to friends and family. It's a good size and our baby likes it so far. We purchased it to have something for the baby to sleep in when traveling and it folds up small to fit in a suitcase. We used it at the beach in our beach tent he slept well and at our family bbq on the grass it was perfect for my lil one to sleep on his back the way he loves it. Perfect for my new born so. Package came on time. Keeps bugs out. It’s also super comfy with the padding. I really loved this bed. It helped keeping my little one away from mosquitoes. Also, it helped from rolling and falling off the bed. I purchased this for my baby, He enjoys it and sleeps in it for every nap and for hours. Quality based product and easy to assemble. It’s really pretty exactly as it is In a pic. I couldn’t wait to open it and use it for my little one, so I did. It just look so pretty. I love it so as my little one. It folds up nice and flat (small enough to fit in a backpack) and when unfolded it is very large, it would even fit a 1 year old (2 month old in picture here). We used it at the beach, backyard and pool. Keeps the bugs out.